Montessori Messy: The Trouble with Tribbles (er, I mean with Amish Friendship Bread)! 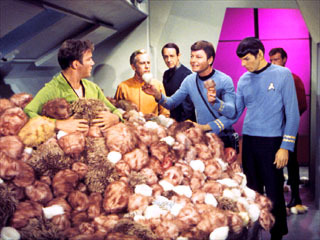 The Trouble with Tribbles (er, I mean with Amish Friendship Bread)! Earlier I wrote a post about Amish Friendship Bread. It's been a couple of months now that I've mothered my little starter bag. I've mushed and coddled it; I've shared it; I've forced it on unsuspecting friends; I've tried to keep up with the demands of its 10-day cycle. Enough. After 10 days, you have 4 bags of starter. After 20 days, you have 4 x 4 = 16 bags. After one month, you have 4 x 4 x 4 = 64 bags! Yes, we got caught in the cycle one time when we were newly married. There's only so much Amish Friendship Bread one can make and/or give away! With the start of school, I needed a break too. So I froze the starter!